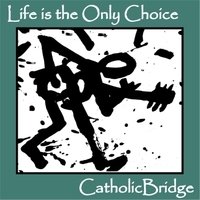 Below are 6 music collections by CatholicBridge, a band lead by Hugh and Diane of this site. Purchasing music is a great way to support our work. Some of our best work to date. High energy Christ-centred youth cuts with catchy hooks and infectious grooves. Several beautiful worship songs, including "Across" which received much airplay on Christian radio. How to get it an listen to it. At concerts, children run to the front to sing and do the hand gestures. Inviting them on stage became a highlight. This is a collection of songs that children love most at our concerts, with a solid Christian message for kids. 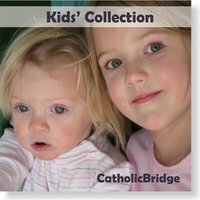 This pro-life, pro-family collection contains 5 National March for Life theme songs, the theme for Canada's March for Marriage, and "Yes to Life", the theme from a Humane Vitae Conference. Our Debut CD: received much airplay on Contemporary Christian radio. Holy of Holies went to #8 on local Christian Radio and Cult Cult-ure went to #3. 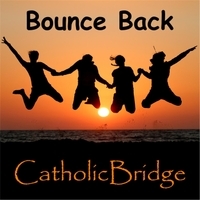 This is the one that started it all, and led to the building of Catholic Bridge website. If you want to just buy one collection with 19 of our most popular songs, this is the one to get. These are the songs that got airplay and great responses at live concerts. They will not dissapoint anyone who loves great pop music with a Catholic message. Kids and youth love it too. 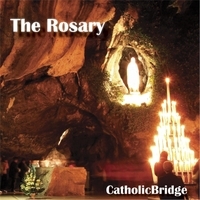 A simple, quiet Rosary recitation with original soft background music. 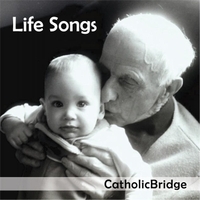 The 4 CD set contains the Joyful, Sorrowful, Luminous, and Glorious Mysteries. This has outsold all our other music. We owe it to our Lady. y a Juan él te entregó. Make me a man of God. that walks by faith and not by sight.